(1) Establishment. The grade of all streets, alleys and sidewalks shall be established by resolution by the Village Board and the same recorded by the Village Clerk in his/her office. No street, alley or sidewalk shall be worked until the grade thereof is established. (2) Alteration of Grade Prohibited. No person shall alter the grade of any street, alley, sidewalk or public ground or any part thereof in the Village of Ferryville by any means whatsoever unless authorized or instructed to do so by the Village Board. All such alterations of grade shall be recorded in the office of the Village Clerk by the Clerk or the officer authorizing the alteration. (3) Penalty. The penalty for violation of any provision of this section shall be a penalty as provided in s. 13.04 of this code. (1) Owner to Construct. It shall be the duty of the abutting owner to build, repair, construct and perpetually maintain sidewalks along or upon any street, alley or highway in the Village of Ferryville and to pay one-half of the entire cost thereof. Whenever the Village Board shall by resolution determine that a sidewalk be laid, rebuilt, repaired, lowered or raised along or upon any public street, alley or highway within the Village of Ferryville, it shall proceed according to s. 66.0907 of the Wisconsin Statutes. (2) Permit Required. No person shall hereafter lay, remove, replace or repair any public sidewalk within the Village of Ferryville unless he/she is under contract with the Village to do such work or has obtained a permit therefore from the Village Board at least 7 days before work is proposed to be under taken. No fee shall be charged for such permits. shall extend at least one foot beyond each edge of the sidewalk. (b) Material. All sidewalks shall be of air entrained concrete composed of 6 bags per cubic yard of one course construction, and built to the established line and grade. Gravel shall be of good quality and washed. Concrete shall be mixed thoroughly after all materials have been placed in the mixer. (c) Forms. Concrete shall be placed in straight forms of wood or metal of sufficient strength to resist springing, tipping or other displacement during the process of depositing and consolidating the concrete. Wood forms shall be surface plank of at least 2 inches of thickness except for sharply curved sections. Metal forms shall be of approved section. The forms shall be of full depth of the required walk and shall be of such design as to permit secure fastening. Forms shall be thoroughly cleaned and oiled before the concrete is placed against them. Concrete shall be placed in the forms on a moist sub grade, deposited just above the finished grade and consolidated and spaded sufficiently to bring the mortar to the surface and to prevent honeycombing. It shall then be struck off level with the top of the forms and finished with wooden flats. To provide adequate drainage the sidewalk shall slope toward the curb at a minimum rate of 1/4 inch per foot or width or sidewalk. All joints and edges shall be finished with a 1/4 inch radius edging tool. (d) Width and Thickness. Residential walks shall be 5 feet in width and not less than 4 inches thick except within driveway approaches where the minimum thickness shall be 6 inches: provided that walks in residential areas may be repaired or replaced to a width not less than the existing width on the effective date of this section. Sidewalks in front of commercial or industrial establishments shall be not less than 8 feet in width and 5 inches in thickness except within driveway approaches where the minimum thickness shall be 7 inches. (e) Finishing. Before the last finish has set, the sidewalk shall be steel troweled and brushed in transverse direction. Before final finishing, the surface shall be checked with a 10 foot straight edge and any areas departing more than 1/8 inch form the testing edge shall be corrected by adding or removing concrete while the concrete in the walk is still plastic. (f) Jointing. Transverse, full depth, 1/2 inch thick expansion joints of premolded expansion material shall be located every 40 feet and at the property line, and where the walk intersects another walk, curb line, building or driveway approach, and at buildings, walls, poles and stop boxes. The expansion joint material shall be placed in a neat and workmanlike manner with its upper edge slightly below the finished sidewalk surface. Dummy groove joints for controlled cracking, at least one inch in thickness and 5/16 inch in depth, shall be placed at intervals of approximately 5 feet. Steel division plates shall be placed at right angles to the center line of the sidewalk as intervals at not less than 15 feet. All joints shall be at right angles to the direction and grade of the walk. Diagonal joints may be used only when approved by the Director of Public Works. (g) Curing and Drying. As soon as any of the concrete work hereinbefore mentioned has been finished and hardened sufficiently to prevent excessive marring of the surface, it shall be cured and protected against rapid drying. Failure to comply with this requirement shall be deemed sufficient cause for suspension of the work. provided in s. 13.04 of this code. (1) Approval Required. No person shall construct or maintain any driveway across any sidewalk or curbing or right-a-way without first obtaining a driveway permit from the Village Clerk and Director of Public Works, or Wisconsin DOT (Main Street) or Crawford County Highway Commissioner (Highway C). 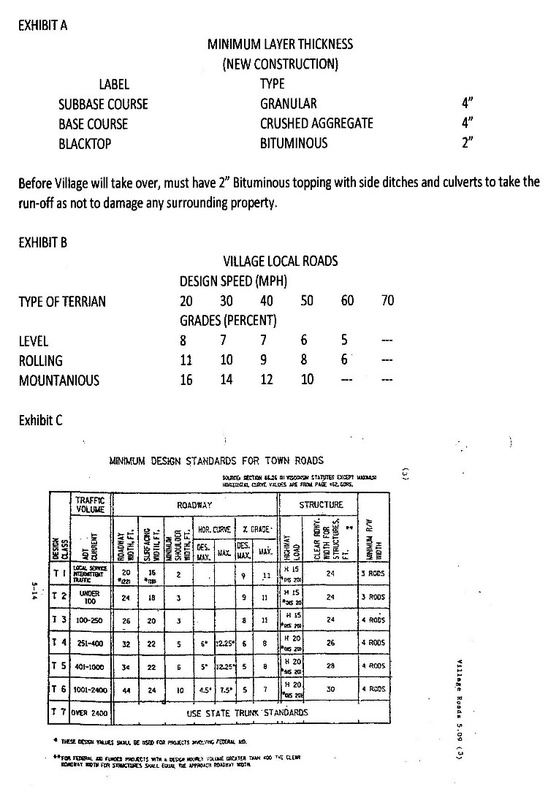 (2) Specifications for Driveway Construction. (a) Width. No Driveway shall exceed 24 feet in width at the outer or street edge unless special permission is obtained from the Village Board. (b) Interference with Intersections Prohibited. At street intersections a driveway shall not provide direct ingress or egress to or from the street intersection area and shall not occupy areas of the roadway deemed necessary by the Village Board for effective traffic control or for highway signs or signals. (c) Interference with street. No driveway apron shall extend out into the street further than the face of the curb, and under no circumstances shall such driveway apron extend into the gutter area. All driveway entrances and approaches shall be so constructed that they shall not interfere with the drainage of streets, side ditches or roadside areas or with any existing structure on the right of way. When required by the driveway permit to provide for adequate surface water drainage along the street, the property owner shall provide any necessary culvert pipe at his/her own expense. (d) Number of Approaches limited. No more than one driveway entrance and approach shall be constructed for any lot or premises except where deemed necessary and feasible without undue impairment of safety, convenience and utility of the street by the Village Board. Any 2 approaches shall be at least 10 feet apart. (e) Workmanship and Materials. All driveway entrances and approaches which are constructed across sidewalk shall be paved in accordance with the requirements for sidewalk construction in s. 5.02 (3) of this code insofar as such requirements are applicable, including thickness requirements in s. 5.02 (3) (d). (f) Permittee Liable for Damage or Injury. The pemittee shall assume all responsibility for any injury or damage to persons or property resulting directly or indirectly during construction or repair of driveway approaches or entrances. When curb or gutter is removed, the new connection shall be of equivalent acceptance material and curb returns provided or restored in a neat, workmanlike manner. Driveway surfaces shall connect with the street pavement and sidewalk is a neat, workmanlike manner. Any sidewalk areas which are damaged or are inadequate by reason of vehicle travel across the sidewalk shall be replaced in accordance with the requirements of s. 5.02 (3). 5.04 STREET AND SIDEWALK EXCAVATIONS AND OPENINGS. (1) Permit Required. No person shall make or cause to be made any excavation or opening in any street, alley, highway, sidewalk or other public way within the Village of Ferryville without first obtaining a permit therefore from the Village Clerk and Director of Public Works. (2) Fee. The fee for a street opening permit shall be $2.00 and shall be paid to the Village Treasurer who shall issue his/her receipt therefore. (3) Bond. Before a permit for excavating or opening any street or public way may be issued, the applicant must execute and deposit with the Village Treasurer an indemnity bond, approved by the Village President, in the sum of $5,000 conditioned that he/she will indemnify and save harmless the Village of Ferryville and its officers from all liability for accidents and damage caused by any of the work covered by his/her permit, and that he/she will fill up and place in good and safe condition all excavations and opening made in the street, and will replace and restore the pavement over any opening he/she may make as near as can be to the state and condition in which he/she found it, and keep and maintain the same in such condition, normal wear and tear excepted, to the satisfaction of the Village Board for a period of one year, and that he/she will pay all fines imposed upon him/her for any violation of any rule regulation or ordinance governing street openings or drain laying adopted by the Village Board, and will repair any damage done to existing improvements during the progress of the excavation in accordance with the ordinances, rules and regulations of the Village. Such bond shall also guarantee that if the Village shall elect to make the street repair, person opening the street will pay all costs of making such repair and of maintain the same for one year. Recovery on such bond for any accident, injury, violation of law, ordinance, rule or regulation shall not exhaust the bond but it shall cover any and all accidents, injuries or violations during the period of excavation for which it is given. An annual bond may be given under this section covering all excavation work done by the principal for one year beginning January 1, which shall be conditioned as specified above and in the amount determined by the Village Board as necessary to adequately protect the public and the Village. (4) Insurance. Prior to commencement of excavation work a permittee must furnish the Village Board satisfactory written evidence that he/she has in force and will maintain during the life of the permit and the period of excavation, public liability insurance of not less than $100,000 for one person, $300,000 for one accident and property damage insurance of not less than $50,000. (5) Regulations Governing Street and Sidewalk Openings. (a) Frozen Ground. No opening in the streets or sidewalks for any purpose shall be permitted when the ground is frozen, except where necessary as determined by the Village Clerk and Director of Public Works. (b) Removal of Paving. In opening any street or other public way, all paving or ballasting materials shall be removed with the least possible loss of or injury to surfacing material and together with the excavated material from trenches shall be placed so as to cause the least practicable inconvenience to the public and permit free flow of water along gutters. (c) Protection of Public. Every person shall enclose with sufficient barriers each opening which he/she may make in the streets or public ways of the Village. All machinery and equipment shall be locked or otherwise effectively safeguarded from unauthorized, use when not being used by the permittee, his/her agents or employees. Red lights or torch lamps shall be kept burning from sunset to sunrise, one red light or torch lamp to be place at each end of the opening in the street or way and other lights sufficient in number and properly space to give adequate warning. Except by special permission from the Director of Public Works no trench shall be excavated more than 250 feet in advance of pipe laying nor left unfilled more than 500 feet where pipe has been laid. All necessary precautions shall be taken to guard the public effectually from accidents or damage to persons or property through the period of the work. Each person making much opening shall be held liable for all damages, including costs incurred by the Village in defending any actions brought against it for damages, as well as cost of any appeal, that may result from the neglect by such person or his/her employees of any necessary precaution against injury or damage to persons, vehicles or property of any kind. approved backfill material. All rubbish shall be immediately removed, leaving the street or sidewalk in perfect repair, the same to be so maintained for a period of one year. In refilling the opening, the earth must be puddle or laid in layers not more that 6 inches in depth and each layer rammed, tampered or flushed to prevent after-settling. When the sides of the trench will not stand perpendicular, sheathing and braces must be used to prevent caving. No timber, bracing, lagging, sheathing or other lumber shall be left in any trench. The Village may elect to have the Village make the pavement repair for any street or sidewalk opening, in which case the cost of making such repair and of maintaining it for one year shall be charged to the person making the street opening. emergency exists which makes it absolutely essential that the permit be issued. (7) Emergency Excavations Authorized. In the event of an emergency any person owning or controlling any sewer, water main, conduit or utility in or under any street and his/her agents or employees may take immediate proper emergency measures to remedy dangerous conditions for the protection of property, life, health or safety without obtaining an excavation permit, provided that such person shall apply for an excavation permit not later than the end of the next succeeding business day and shall not make any permanent repairs without first obtaining an excavation permit hereunder. performing work under contract with the Village necessitating openings or excavations in Village streets. (9) Penalty. The penalty for violation of any provision of this section shall be a penalty as provided in s. 13.04 of this code. way obstruct or encumber any street, alley, sidewalk, public grounds or land dedicated to public use. Or any part thereof, or permit such encroachment or encumbrance to be place or remain on any public way adjoining the premises of which he/she is the owner or occupant, except as provided in sub. (2). (a) Signs or clocks attached to buildings which project not more than 6 feet from the face of such building and which do not extend below any point 10 feet above the sidewalk, street or alley. (b) Awnings hereinafter installed or repaired which do not extend below any point 7 feet above the sidewalk, street or alley. (c) Public utility encroachments duly authorized by state law or the Village Board. (d) Goods, wares, merchandise or fixtures being loaded or unloaded which do not extend more than 3 feet on the sidewalk, provided such goods, wares, etc., do not remain thereon for a period of more than 2 hours. (e) Temporary encroachments or obstructions authorized by permit under sub. (3). (f) Excavations and openings permitted under s. 5.04. (a) When Required. Permits for the use of the streets, alleys, sidewalks or other public ways or places of the Village may be granted to applicants by the Village Clerk and the Director of Public Works for the purpose of moving any building or structure or of encumbering the street, alley, sidewalk or way with materials necessary in and about the construction or demolition of any building or structure, provided such applicant has complied with the other requirements of this subsection and has obtained a permit. (b) Bond. No street privilege permit shall be issued until the applicant shall execute and file with the Village Clerk a bond in an amount determined by the Director of Public Works, conditioned that the applicant will indemnify and save harmless the Village Of Ferryville from all liability for accidents or damage caused by reason of operations under said permit and will remove such encumbrance upon termination of the operations and will leave the vacated premises in a clean and sanitary condition and repair any and all damage to the streets, alleys, sidewalks and public property of the Village resulting from such building or moving operation. (c) Fee. The fee for a street privilege permit shall be $10. (1) Such temporary obstruction shall cover not more that 1/3 of any street or alley. (2) Obstructions shall be sufficiently lighted at night so as to be in full view of the public from all directions. (3) Sidewalk traffic shall not be interrupted, but temporary sidewalks of not less than 4 feet in width guarded by a closed fence at least 4 feet high on both sides may be maintained during the period of occupancy. (4) The process of moving any building or structure shall be as continuous as practicable until completed, and if ordered by the Director of Public Works, shall continue during all hours of the day and night. (5) No building or structure shall be allowed to remain overnight on any street crossing or intersection or so near thereto as to prevent easy access to any fire hydrant. (6) Buildings shall be moved only in accordance with the route prescribed by the Village Board. (7) Upon termination of the work necessitating such obstruction, all parts of the streets, alley, sidewalks or public grounds occupied under the permit shall be vacated, cleaned of all rubbish and obstructions and placed in a safe condition for public travel at expense of the permittee. end of 3 months from the date of issuances unless an earlier termination date is specified thereon at the direction of the Village Board. penalty as provided in s. 13.04 of this code. (1) The owner, occupant or person in charge, of a property abutting a street shall clean the sidewalk abutting such lot of snow or ice to the full width of such sidewalk within 24 hours after the cessation of snowfall, and shall cause the same to be kept free from snow or ice; provided, that when ice has so formed on any sidewalk that it cannot be removed, said owner, occupant or person in charge shall keep the same sprinkled with sand, salt or a non slip substance. (2) Noncompliance - Village Action. In cases where any sidewalk remains covered in any part with snow or ice longer than 24 hours after the cessation of the most recent snowfall, it shall be the duty of the Public Works Director to cause such snow or ice to be removed from the full width of such sidewalk and to report the date when, and address where such work was done, and whether the sidewalk length exceeded 100 feet, to the Village Treasurer, who shall insert the following amount in the tax list thereafter to be made as a "special charge" against the property abutting such sidewalk, which shall be collected as other taxes when real estate taxes are collected. The Public Works Director may contract, as required, to complete the removal of snow and/or ice. First time shoveled, $100; second time shoveled during the same winter $150; third and subsequent times shoveled during the same winter $175. First time shoveled, $200; second time shoveled during the same winter $250; third and subsequent time shoveled during the same winter $275. (1) Trees to be Kept Trimmed. Trees standing in and upon any public street or place, or upon any lot or land adjacent thereto shall be pruned and trimmed by the owner or owners or occupants of the property on or in front of which such trees are growing so that the lowest branches projecting over the public street or alley will provide a clearance of not less than 14 feet and a clearance of not less than 10 feet over any other public place and so that no dead, broken or otherwise hazardous branches shall be likely to fall and do injury to the public. Any tree not trimmed as herein provided shall be deemed hazardous. Trees and shrubs adjacent to any sidewalk shall be pruned and trimmed by the owner or occupants of the property to allow safe passage for the full width of the sidewalk. endanger the public or other trees, plants or shrubs growing within the Village, or to be injurious to sewer, sidewalks or other public improvements whether growing upon public or private premises shall be removed, trimmed or treated by the owner of the property upon or adjacent to which such tree or part thereof is located. The Director of Public Works shall give written notice to said owner to remedy the situation which shall be served personally or posted upon the affected tree. Such notice shall specifically state the period of time within which the action must be token, which shall be within not less than 24 hours or more than 14 days as determined by the Director of Public Works on the basis of the seriousness of the condition of the tree or danger to the public. If the owner shall fail to remove, treat or trim said tree with the time limited, the Village Board shall cause the tree to be removed, treated or trimmed and shall report the full cost thereof to the Village Treasurer who shall thereupon enter such cost as a special charge against the property. (3) Cottonwood and Box Elder Trees Prohibited. No person shall plant or maintain within the Village of Ferryville any female tree of the species Pupulus Deltoides, commonly called the "Cottonwood" or any tree commonly called the seed-bearing Box Elder or Acer Negundo, which may now or hereafter become infested with Box Elder Bugs, and such trees are hereby declaring a nuisance. Any person having any such trees on his premises shall cause the same to be removed. If any owner shall fail to remove any such tree within 30 days after receiving written notice from the Director of Public Works, the Director shall cause the removal of such tree and report the full cost thereof to the Village Treasurer who shall place such charge upon the next tax roll as a special charge against the premises. shall cause the removal of any tree planted in violation of this subsection. (5) Penalty. The penalty for violation of any prevision of this section shall be a penalty as provided in s. 13.04 of this code. (1) There shall be no bill boards erected within the Village limits of the Village of Ferryville. Unless it is on the persons own property and advertising their own business. (2) Penalty. Any person shall violate this ordinance shall be subject to a penalty as provided in s. 13.04 of this Municipal Code. firm, partnership or corporation and there after request is made by that person, firm, partnership or corporation to the Village to accept said street or roadway as a Village Street must meet the following specification. See Exhibits "A", "B", and "C" attached hereto and made a part of this Ordinance. (2) Not withstanding the above the Village of Ferryville will not be compelled to accept any street or roadway as a Village Street even though that street or roadway meets the standards herein met forth.